Visit a unique place that will take your breath away, and leave you to wonder about the wisdom of the invisible hand that has created such beauty. The island of Santorini is a truly magical and mystical place and the Blue Dolphins Apartments & Suites have been planted right in the middle of this magic. Located in Firostefani and overlooking the famous volcano and the Aegean Sea, you will be able to feast on the tranquility of the nature before you, and take a break from everyday routine. Spend your day at the veranda of the hotel & enjoy the view & peacefulness of the scenery. 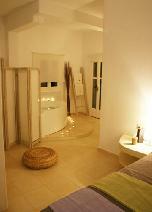 You can stay at our Standard Doubles, Jacuzzi & Romantic Suites & Studios which have been refurbished in 2010. The Honeymoon Jacuzzi Suites are really unique and the Romantic suites private veranda is ideal for your wedding ceremony and party. Live the experience of the Cave house! Standard Doubles have new renovated bathrooms & a Sea view. 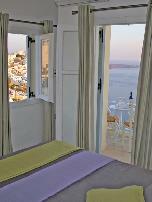 Suites have private balconies & a magnificent view to the Volcano. All rooms come with LCD Cable TV with Cinema & Sport channels, air-conditioning & refrigerator. Other room facilities include daily maid service, home made buffet breakfast, direct dial phone & free wireless internet. Guets watch LIVE in the room all Hellenic, English, Spanish, Italian , German,French, Argentinean & European Soccer Cup, NBA, American Ice Hokey, World Tennis etc. Spend your day at the veranda of the hotel and enjoy the view and peacefulness of the scenery. 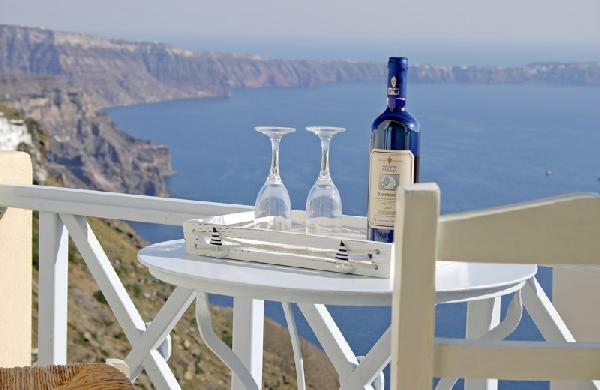 Alternatively, take a 10-minute stroll to the village of Fira or a 15-minute drive to the notorious sand beaches of Santorini and enjoy the Greek sun and sea. We will guide you find the restaurants, night clubs and beach bars of your style. Visit the archeological sites, the volcano & hot springs or join a wine tasting tour to experience the local wine... One thing is certain. There is always something new and exciting to do. January-February-March: Stay 4 nights & enjoy 1 night free + a full mini bar including soft drinks, beers & a bottle of wine! Low Season & June: Stay 4 nights enjoy a free rented car for 2 days or free transfers! Bluedolphins Villa & Hideaway House: Stay 7 nights & pay 6!
! !+10% discount for pre- payment in paypal !! 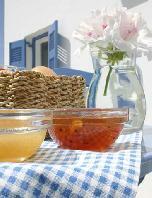 We have sister hotels in Athens, Mykonos, Paros & Crete & will offer you special deals. Είστε ιδιοκτήτης ή διευθυντής στο BLUE DOLPHINS; Εγγραφείτε τώρα για δωρεάν εργαλεία, που μπορείτε να χρησιμοποιήσετε για να βελτιώσετε την καταχώρησή σας και να συνδέσετε την ιστοσελίδα σας και το σύστημα κρατήσεών σας.